Cleveland’s Melt Bar & Grilled masks decadence with the trappings of comfort food, offering a homestyle grilled cheese sandwich with the works and delivering a grease-filled monstrosity of dripping goop and fried-to-a-crisp everythings. However, this is not Melt’s condemnation, but its greatest success. It is unique in the truest sense of the word, and a beer-bathed beacon of hope in Cleveland’s sparse culinary landscape. With the Hard Rock Cafe and House of Blues ranking as two of the city’s top ten restaurants, Matt Fish’s entrepreneurial gem has set fire to more than the Cuyahoga River. 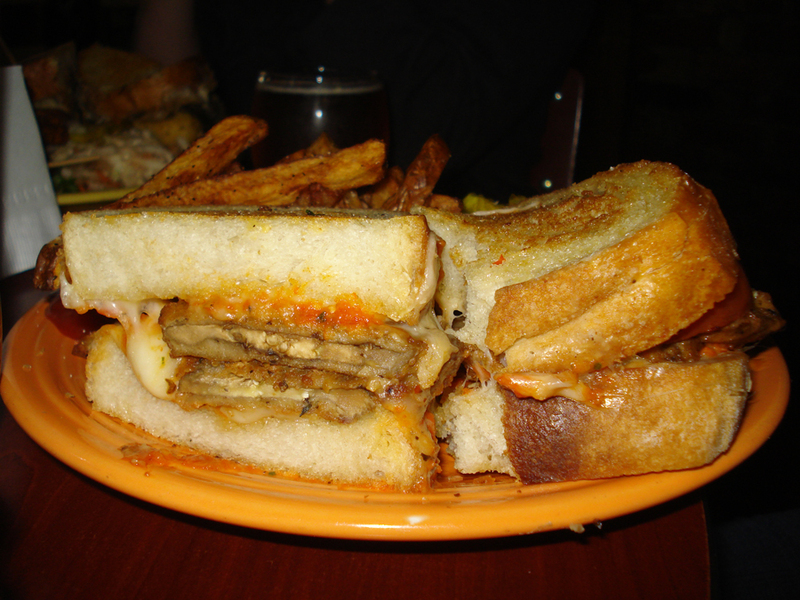 The “Purple Parma” is the eatery’s vegan melt of choice. Hand breaded eggplant, grilled tomato, sun-dried tomato pesto and provolone cheese, easily replaced with a choice of vegan cheddar or mozzarella, smashed hard between two buttery slices, served with crispy fires and coleslaw. In the four years I spent as a resident of the Metropolis of the Western Reserve, sandwiches never came close to equaling this. Melt expects you to wait – I never personally waited less than 45 minutes for a table, even as the restaurant was opening – but the payoff, from the presentation of the “alternative” style waitstaff to the somehow happy feeling of a brick in your stomach as you leave, is worth any wait. Melt Bar & Grilled nearly transcends food reviews, battering me with pleasant sensory memories until I’ve found myself writing hundreds of words that amount to a shill. The process isn’t perfect, and as my brain matures it may find itself less and less willing to wait up to two hours for a grilled cheese sandwich – but for now the speciality of the specialty is enough.